Evergreen shrub, up to 40cm high, native to South America, Central America, also cultivated; root knotty, with transverse rings; leaves opposite, simple, elliptic, acuminate; flowers small, white, funnel-shaped. When the ipecac alkaloids cephaeline, emetine and the synthetic 2-dehydroemetine (as dihydrochlorides) were administered to rabbits and cats, the effects of the three alkaloids on respiratory tract were identical. The volume output of respiratory tract fluid was increasingly augmented by doses of from 0.1 to 1.0 mg/kg. Doses of from 9.0 to 81 mg/kg were increasingly lethal. European Pharmacopoeia require alkaloid contents of the root drug near 2% (AB-DDR 1.9-2.1%, Ph.Helv.VII min.2.0%, ÖAB and DAB 1.8-4%). At about 10 times the therapeutic dose of ipecac extract used to treat chronic bronchitis, it is strongly emetic. The extract is used in emetic syrups to induce vomiting in case of accidental poisoning. As emetine (methylcephaeline) intercalates DNA and blocks protein biosynthesis, it is cytotoxic and used as anti-amoebic drug. 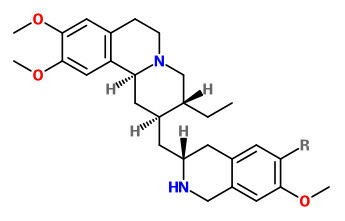 The isoquinoline alkaloids emetine and cephaeline, identified as the major bioactive compounds, accumulate in the roots throughout the year. The highest mean content of emetine was found at 0.4-1.4%, highest mean content of cephaeline was found at 0.15-0.26%.